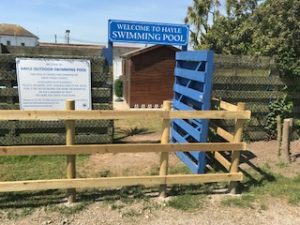 Hayle Outdoor Swimming Pool opens its doors for the 2017 season on Saturday 24 June at 11.00am. Free entry for everyone on opening day! Please note that there is a new entrance to the pool – from Jubilee Bridge turn right past the pool and into the car park at the end of King George V Memorial Walk, where you will see a brand new swimming pool entrance sign, with a fenced area separated from the car park so that you can queue in safety. 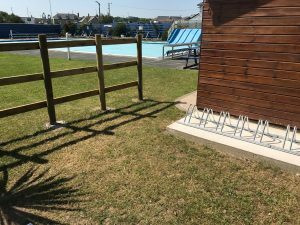 There are now nine cycle racks inside the pool complex – so please feel free to leave your bicycles chained to them while you have a swim. For further information please see the Outdoor Swimming Pool page.